"The most complete equipment reference book published to date." This [b]Technical Readout[/b] lists the capabilities and history of the most common pieces of military hardware used by the major houses of the Successor States in the year 3025. 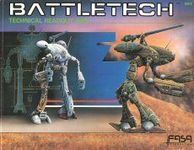 Focusing on BattleMechs and Aerospace Fighters, this volume also discusses important combat and support vehicles as well as the rare Land-Air-Mechs. In all, 55 'Mechs, 15 fighters, 3 LAMs, 4 DropShips, and 12 Vehicles are described and illustrated, making this volume a must for all, from historians to Mechwarriors.